Do you open up your range when you are the big stack? Pretty much the title. This is a situation that I'd like to think isn't uncommon and I was wondering how you folks like to approach it. I'm sure that every situation is different, but is there a general approach anyone takes? Do you get in more pots and try to bully people? Do you open up a but otherwise play mostly the same as otherwise? Or maybe don't change anything at all? What do you guys do? Similar Threads for: Do you open up your range when you are the big stack? if i have large stack i like to lean but depends who im playing, the more timid they are the easier. be careful it can bite u. In a tournie I like to open wide with any two cards. If the table is pushing back then I might limp into some pots and of course trying to play position. As a big stack - let me amend that - huggge stack - you have the luxury of being involved in every pot. Sometimes your opponent will shut down and if you are in position....take advantage of their mistakes. Of course until when players allow it and want it! 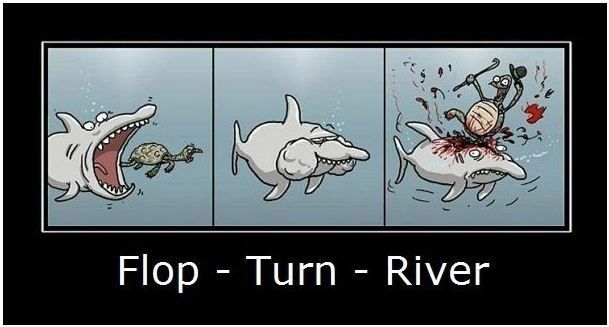 If you, however, have a lot more than twice the advantage of the other big stack better be careful, because as a rule you will be less lucky in the river! With a large stack, you can play more freely, but still do not lose your head, and then you can stay with nothing. With big stack, you can put pressure on Blinds, you can even three bet light against an open. I use the 3bet light a lot because now a day, people raise with any two suited card; so it is much better to 3bet. But you have to be careful not over doing it because they will call you down. it depends on the players who are present on the table. if I have the opportunity to impose myself on the table I seize the opportunity and continue to play wide but if it has too much activity on the table I play tighten to benefit at least a good reputation to be able to fly some pot. I think pressuring your opponents is usually the correct strategy with a big stack, but you can also go too far and end up getting taken advantage of by the shortys. If the table "allows it",,i will steal blinds and push around abit. It is usually expected for big stack to be looser.. I know i used to have a problem of letting big stacks get to my head and end up losing it all. Now i've learned it is better to play small ball poker when u have a big stack, and steal pots... without calling all ins unless ur nutted of course. re: Poker & Do you open up your range when you are the big stack? I know what happens to the hands when I am deep. AA KK QQ go down in value small pocket pairs go way up in value implied odds. TPTK goes WAY down. Big aces go way down. SConnectors with 1 gappers go up in value. Ace nuts flush goes way up in value. I do way too often.. then I end up short stacked and try to tighten up.. Biggest leak I have. I'll tend to call in position more, but it depends on the players. The one thing I don't recommend is blindly getting more aggressive preflop just because you cover your opponents. Make sure you take into account how often they will fold to a reraise or cbet if you are going to try to be a big stack bully. I have a strictly Select of Hands which I play and not.Im not leaving this strategy,wether I have a big or small Stack. Why sould I suddenly Play 72off?This is a loosing Hand and I dont want to give my Chips away easily.Soon enough the Blinds will be that high,that my Stack will not be too big anymore. But it could be that I call higher Raises than normal,but with the right Hand too. I think the only strategy and knowing the time to bet and give up, an example: if you have pair kk and flop comes 3AA and your opponent all-in you think he's bluffing? It pays to see him go out with a full house court bigger than yours or a crack and you with two pairs, dude, is it okay to jump out and risk losing everything? P.S:And I call more All-Ins,but only if I know that whats left is still enough if I might loose. If your stack is 2-3x the other players at the tables stack then you shoulder consider opening a little wider. Be flexible with what you 3-bet, you'll take a lot of hands down pre-flop. Yes, especially when the blinds are low if I have more than doubled my stack early and again later in the tourny it's good to put pressure on the short stacks trying to min cash. I still tend to think it's a matter of luck and bluff. I open the range, yes, I think it's natural, it's even better because you can put pressure on your opponents, but it requires a lot of care too. If my stacks are deep I have a tendency to open up my play, but not a large change honestly. I may extract pressure on certain players if I believe them to be weak. Don't get me wrong I'm not going give my chips away. I am only going to test the waters and if my stack keeps getting deeper than I will keep enjoying this more open style of play until I deem it time to tighten my game back a little bit. Opening up your starting hands is a living and breathing thing with your stack size. It's actually kind of neat, because while your starting hands are opening up a bit, in all reality somebody else's starting hand are tightening up. It's like the Yin and the Yang. I do believe though, that if your stacks are deep that you should definitely me more aggressive with your hands. Just don't start getting silly on us or your stack will dwindle in short fashion. When you are a big stack, you can see many more hands, you can open your range, also depends on the players you have on the table if a table tight, I think you can leverage your stack and be aggressive, but you should always have care with another big stack, you should also see how many bb have the villain, all those things are important. but you cant play from out of position, that is stupid no matter what. hands mid to late position, and use the stack to put pressure on villains. I like to put a small stack to the test for all their chips, but I want to have at least and ok hand with some potential to do this just in case they call. When I have a big stack I open my range more simply because I can afford to take a little more risk playing suited connectors and stealing blinds in position. I love it when the bigger stacks bully, it creates massive opportunities for short stacks and to be honest, when you are short stacked and you need chips, table bullies are vital to have..
Long live the the bully! I think the key word that the pros use here is 'adjustment'. When you think of 'adjustment', you picture a watchmaker with a magnifer and a tiny gear on a watch. At the beginning, I often over-adjusted (though late opens such as SB vs BB can sometimes theoretically justify this). By all means yes. What better time to do it after all. My level of aggression depends on the stage of the tournament, and opponents. The Green Paper Phil Gordon says that at different stages of tournament play with a different range of cards. You have to remember that even with a large stack of participating in the drawing of your stack becomes less if you do not win. Do you open your range...? Absolutely, but always taking into account the moment of the game, the position and all the other basic precautions.